Verrucas are among the most common dermatologic conditions the podiatrist treats. 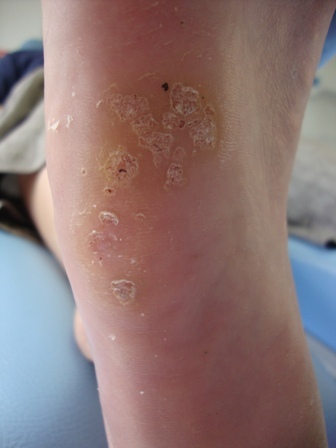 Verrucas that are also known as warts can be difficult to treat and cure, however before we discuss treatment plans for verrucas its important to understand what verrucas really are. Verrucas can be classed as benign (not cancerous) tumors caused by an infection to the part of the skin called the epidermal kertatinocyytes. The infection is caused by a double stranded DNA human papilloma virus (HPV). All papilloma viruses cause infections in the skin or mucus membranes. Since warts are viral infections, treatment can be challenging. There are over 200 known types of HPV! However the most common warts on feet are types of HPV1, HPV2 ad HPV4. HPV1 are large painful verrucas and commonly occur on the soles of the feet. These Verrucas are painful when standing and tend to have vacuolization which basically means they have fluid filled cells. There is often damage through the entire epidermis. HPV2 are mosaic verrucas. These tend to be less painful but spread over larger area and you often get a scaling type appearance with these verrucas. These Verrucas tends to damage the superficial layers of the epidermis only. HPV4 are multiple verrucas, these are generally less painful the HPV1 and HPV2 but can be numerous small circular lesions. As discussed verrucas are caused by the human papilloma virus but how does this virus get on to your skin? Well the most common way to contract the virus is through person to person contact or close contact with contaminated objects or surfaces. Areas around swimming pools and changing rooms provide ideal breeding grounds to contract the virus as your more likely yo get infected when you skin is damaged or wet. Sharing towels, shoes and socks with someone that has verrucas can also lead to infection. There is anecdotal evidence that when individual s are immune compromised at times of stress of pregnancy can make you more likely to contract the virus. Before we talk about the various treatment options our clinic can provide its important to discuss a few common sense preventable measures. although it may seem quite obvious, avoid touching other people warts even if they are your loved ones. Avoid sharing towel, socks and shoes with people that have verrucas and keep your own feet clean and dry. Most importantly don't walk around communal areas in gyms, swimming pools barefoot. Don't scratch your verrucas as this may spread the Verrucas to other pats of your body. When a patient presents to our clinic with Verrucas, we have a discussion about the degree of difficulty that we may have in rapidly resolving the wart(s).We explain to the patient that we are treating a skin infection caused by a virus that may be resistant to many of the common treatments that are available.We will generally discuss all of the different treatment options and give more detail on the particular treatments we provide. Below are a list of a few of the treatment options we can provide at the clinic, the treatment options offered will be highly dependent on the type of Verruca, location of the lesion and the patient medical history and lifestyle factors. The latest ground-breaking microwave therapy to treat verrucas is Swift. Swift is an advanced ultra-modern piece of technology, which requires no use of needles, creams or injections and is easy and fast to use. Swift is an innovative technology that was established in the UK. It has been approved for use in Dermatology and Podiatry for treating skin lesions. It is a handheld device and uses microwave energy to eliminate verrucas. Microwaves work by generating heat in the wart/verruca, focused under the probe, to a maximum depth of 5mm. Microwaves love water and when the electric field is applied, local water dipoles (H2O) try to align with field but lag slightly behind causing collision between molecules and therefore generating heat. This heat quickly destroys all of the infected cells and creates a very accurate area of treatment. This procedure is performed under local anesthetic and therefore does not hurt. A recent study found that patients experienced minimal post operative pain. The treatment is appropriate for all verrucae / warts although often the largest is targeted in the first instance? Electrosurgery is when high frequency currents are applied into the tissue with the aim of getting rid of unwanted skin lesions such as corns and verrucas. It is a painless method. A current is sent through an electrode to the ground plate and back to the area being treated. This will destroy the tissue where the problem area is. What kind of conditions can electrosurgery help with? A high frequency current is used during electrosurgery to destroy unwanted skin lesions and skin tissue. During this treatment a high radio wave frequency travels from an electrode to the problem area and back to the machine through a ground plate. This high frequency current produces an energy which creates steam; this causes the fluid in the tissues of the problem area to vaporise. Electrosurgery can be used to cut, burn off and dry up skin lesions. The day the operation is to take place, eat and drink like normal. During this procedure you will be awake. A local anaesthetic injection will be given to the nerves near the area that is to be treated. This will numb that area. The radiolase will then be used to remove the dead tissue on the affected area. A pressure relieving pad and an antiseptic dressing will be applied to the area. You will have to arrange for someone to take you home as you will not be able to drive straight after this procedure.This procedure will take approximately 1 to 2 hours. You should rest the foot as much as possible for at least two days after the procedure. The wound will need to be redressed 2-3 days later; a follow up appointment will be needed. The wound will need to be kept dry and covered for one week. You may experience some pain or discomfort after the anaesthetic has worn off, taking paracetamol will help to relieve this. The wound will generally form a scab within two weeks, depending on the size of the treated area. How fast the wound will heal will depend on if the wound has remained infection free and how much you have rested. You may have to visit a Podiatrist to reduce the remaining scab in 4-6 weeks.Most people are able to return to work after 24 hours. This procedure is successful in treating verrucas. 94% of cases are successful after one treatment. Around 6% will require a second treatment. Cryotherapy is one of the treatments available to help resolve a Verruca. Cryotherapy is a controlled destruction of the tissues using very low temperatures i.e. freezing of the skin. Ice is formed inside and outside the cells disrupting the cell where the virus is living. After freezing the skin is allowed to thaw out. Ideally the treatment ruptures the cells and kills the virus. The body’s immune system is then thought to fight off the skin infection. Verruca treatment involves the use of nitrous oxide which rapidly freezes the tissues to -89º. This treatment is not available for use outside of the health care setting; it is much colder than those treatments bought over the counter and as such, work better. It delivers the ice treatment accurately and rapidly. No anaesthesia is required, although it is slightly uncomfortable. The probe is held over the Verruca and the skin is frozen for approximately 5- 10 seconds. The skin is then allowed to thaw out for a couple of minutes before the procedure is repeated. A blister usually develops 24 – 48 hours after the initial freezing treatment. The lesion may also bleed under the skin so forming a blood blister. This may look alarming but ideally the skin needs to blister to help eradicate the verruca. Pain and discomfort may be experienced initially after the blister formation but normally the Cryotherapy is well tolerated by patients. It is advisable to keep the wound dry and avoid excessive walking or swimming for a few days. It’s recommended that you visit a chiropodist before beginning a treatment regime for your verruca removal. That being said many people will try various lotions, paints or creams containing salicylic acid that they purchase over-the-counter from their pharmacy or that are prescribed by a doctor. Salicylic acid burns off the top layer of the verruca. Treatment requires a lot on your part because you have to remember to apply the solution every day, as well as spend time every few days rubbing off the dead tissue from the top of the verruca. If you use the treatment diligently the verruca could clear within 3-6 months. It’s important to familiarise yourself with proper safety precautions when dealing with salicylic acid.